The First NYPD Bike Crackdown? Is this a picture of a New York City police officer issuing the first ticket to cyclists? 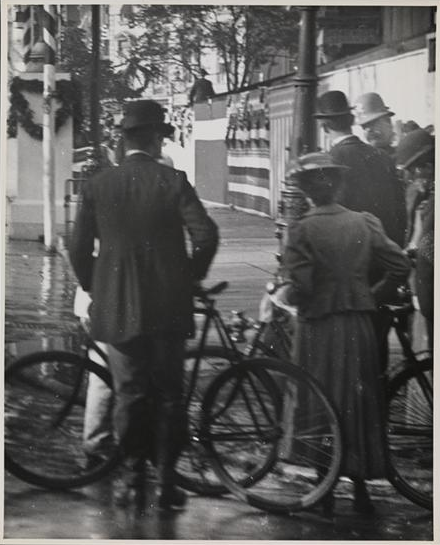 It’s from the Museum of the City of New York and is is listed as depicting “Bicyclists standing with policeman, Dewey Celebration.” Dewey was George Dewey, the Admiral of the U.S. Navy and hero of the Spanish-American War who was feted in New York upon his triumphant return from Manilla Bay. MCNY says the picture is from ca. 1900; most sources say that Dewey Day happened on September 30, 1899.